Again – just two months between visiting and posting! We don’t often go out for breakfast because on the weekends we take it in turns to have a lie in and by the time everyone is up, washed, dressed, fed, watered … well … it’s time for afternoon tea. I should have written about this outing earlier … because all other things aside (food, ambience, service) as we ate we were treated to an impressive display of human flesh. And I’m not talking about someone wearing something a bit tighter or shorter than you might expect. Oh no, a heavily pregnant lady at the table next to us lifted up her top and treated everyone to the considerable expanse of flesh. Just to get things straight – this is not acceptable behaviour for anyone over the age of about 5. You’ve put the clothes on, they can stay on. Anyway, the Boatshed at Hallett Cove has been on my list for a while and on this occasion there was no food in the house so heading out was our only option. It was a lovely sunny morning so I took the precaution of ringing ahead. Toddlers don’t really understand turning up at venues and having to wait. I was told that yes, for three of us it wouldn’t be a problem, and did we want to sit inside or outside. A sunny morning doesn’t necessarily equate to a warm enough morning to sit outside and eat so we opted for inside and my name was duly noted. But sometimes, things just aren’t that simple. And when we arrived, there was no table reserved for us – anywhere. There were a few seats available at the ledge in the verandah but having the three of us lined up wasn’t great and while the view was amazing, the brisk breeze from the ocean suggested that any food would be cold before it hit our lips. Fortunately we were found a small table inside and we squeezed in, between a rather large, loud group of women and the coffee machine. The interior of the Boatshed is all hard surfaces so what started off as an unpleasant level of noise escalated to intolerable by the end of breakfast. Which is a massive shame because the breakfasts were, actually, very good. 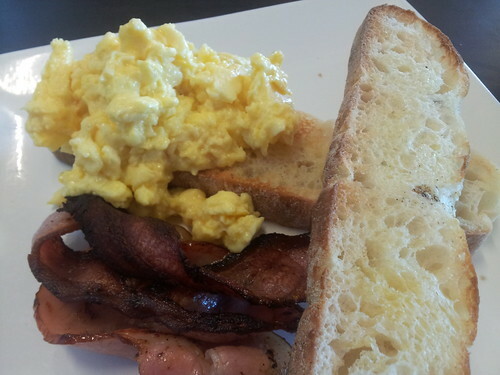 I ordered scrambled eggs and bacon. It was a generous plate with really good quality bread. 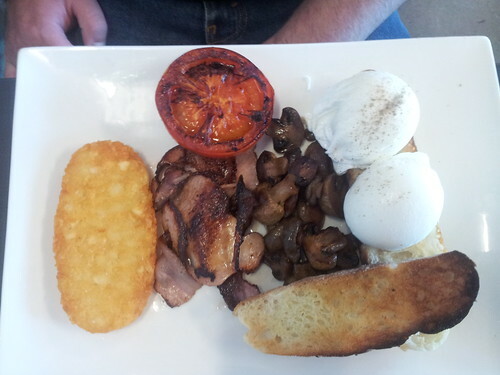 Andy’s Boatshed Classic was similarly proportioned and got a thumbs up (after he’d defended the hash brown from the fingers of a greedy toddler). The menu is very light on things to order smaller punters. While our toddler normally loves eggs he had decided he didn’t want eggs which really limited our options. We ended up ordering him the sweetcorn fritter which Andy said was actually pretty good. So overall, the food gets a tick. Service was OK – the problem with our reservation soured things a little and I did get the impression that there weren’t enough staff (or, the staff that were on were not experienced enough). However, the real killer was the noise inside. We actually got to the point where we couldn’t finish quickly enough. I’ve spoken to friends who have been there and they all tell a similar story – extreme noise inside and erratic service. I would return to the Boatshed for coffee and cake on a warm afternoon when I could sit outside. But that would be it.